My thoughts exactly when Katy Martin sent in the recipe for it. 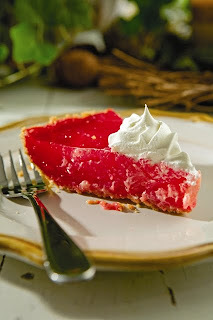 She lives in the heart of Central Florida's citrus belt so when she raved about the Grapefruit Pie from Florida Cafe at Lang Sun Country Groves, I figured she ought to know and whipped one up. To be fair, I warned her I wasn't a great fan of grapefruit. Katy told me she didn't like any citrus but "this pie is amazing." It is good and guessing what's in it will stump a lot of people. The gelatin/cornstarch mixture gets a bit gummy after a day or two and don't substitute plain grapefruit for red; it doesn't work as well. Arrange grapefruit sections in graham-cracker crust. Set aside. In a medium saucepan, combine sugar and cornstarch. Add water and cook over medium heat until thick and clear. Add gelatin and stir to dissolve. Let cool slightly. Pour gelatin over grapefruit sections in crust. Refrigerate until firm. If you can't go there in person - the Lang's grove is in Lake Alfred, FL (near Haines City) - go to their website, www.langsuncountry.com, click on Florida Cafe and you'll find lots of other citrus-centered recipes that sound divine.